Steam turbines are one of the most versatile and oldest prime mover technologies still in general production used to drive a generator or mechanical machinery. Power generation using steam turbines has been in use for over 100 years, when they replaced reciprocating steam engines due to their higher efficiencies and lower costs.Most of the electricity produced in the United States today is generated by conventional steam turbine power plants. The capacity of steam turbines can range from 50 kW to several hundred MWs for large utility power plants. 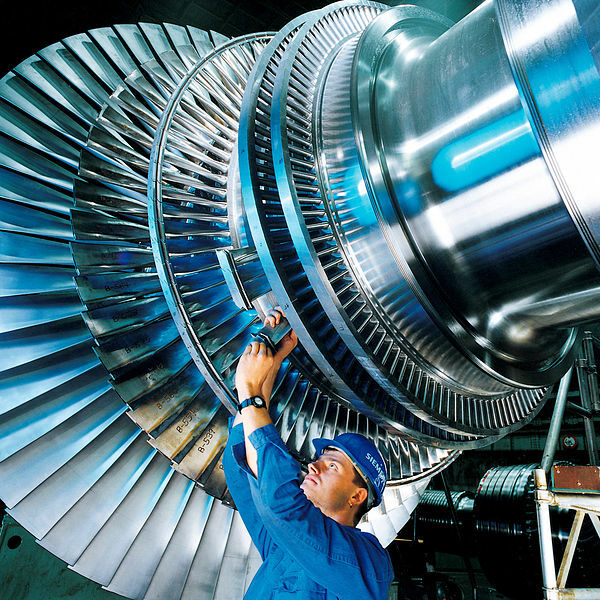 Steam turbines are widely used for CHP applications in the U.S. and Europe. Unlike gas turbines and reciprocating engine CHP systems, steam turbines normally generate electricity as a byproduct of heat (steam) generation. A steam turbine uses a separate heat source and does not directly convert fuel to electric energy. The energy is transferred from the boiler to the turbine through high pressure steam that in turn powers the turbine and generator. This separation of functions enables steam turbines to operate with an enormous variety of fuels, varying from clean natural gas to solid waste, including all types of coal, wood, wood waste, and agricultural byproducts. Steam turbines offer a wide array of designs and complexity to match the desired application and/or performance specifications. Steam turbines for utility service may have several pressure casings and elaborate design features, all designed to maximize the efficiency of the power plant.